Cam Straps make securing a frame or other items in a raft quick and easy. They also work great for tying down loads on cars. Our Cam Straps are made with 1" webbing and come with heavy duty cam buckles with the length of the strap stamped into the buckle. 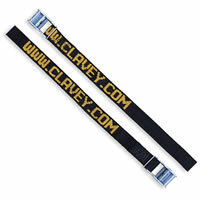 The Clavey Straps are made from 900 lb polypropylene webbing and are black with "www.clavey.com" in yellow. 20 ft. strap. From Steven Riparetti of Santa Barbara, California on 12/14/2014 . 12/26/2016 – Does this come in a set of 1 or 2?